The history of JSC “SG UBI – COOP” is a positive story of the merger of two companies: the famous Insurance Group “UBI” (originated since 2000) and the insurance company of the Ukrainian consumer co-operation system Ukoopgarant (originated since 1997). Since 2017, the Insurance Group “UBI – COOP” is not only a part of the system, but also a reliable partner of consumer organizations and enterprises of Ukraine. The head office of the UBI-COOP Insurance Group is located in Kyiv, and the company has its 19 regional offices and 44 offices in district centers throughout Ukraine. Among the main tasks of the UBI-COOP, the support of the cooperative movement in Ukraine and ensuring its participants with efficient, transparent and affordable insurance protection are especially highlighted. At the same time, the insurance group renders services to both legal entities and physical persons, thereby providing access to quality insurance services to everyone who wishes. UBI-COOP Insurance has become a member of the International Federation of Cooperative and Mutual Insurance ICMIF (London, UK), a global coordinator of cooperative and mutual insurance in the world, thereby confirming its cooperative identity globally. 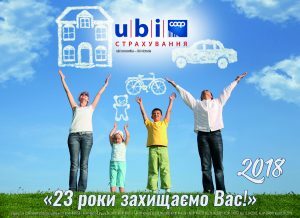 UBI-COOP is a member of the Motor (Transport) Insurance Bureau of Ukraine (MTIBU), and has a consistently high ranking on the quality and speed of the settlement of insurance claims, as well as the absence of complaints. According to the results of 2017, the growth of insurance revenues and insurance claims amounted to more than 130%, which far outstrips the Ukrainian insurance market. At the end of 2017, according to the findings of independent rating agencies Expert Rating and Standard Rating, the Company was given an increased level of financial stability rating at uaAA level, which indicates a high level of financial stability compared to other Ukrainian insurance companies. Among the clients of “Yu.BI.AY – COOP” are such well-known companies as the Ukrainian Institute of Industrial Property (“Ukrpatent”), Ukrkoopspilka, Factory of Antonova, KhDZ Palada, Mironivsky Hliboproduct, Ukrgasbank, Aviancon plant, Volynoblenergo, Kharkiv TPP-5 and others, which testifies to high standards in the work of the insurance company.